The first truck arrives at the Expo Line construction yard. At about noon a few days ago, a 53-foot flatbed semi-trailer filled with art panels pulled up to the Expo Line construction yard. The delivery marked the end of the fabrication phase for 80 of the 176 panels that will be displayed above the entrances and seating areas at 10 Expo Line stations. The Expo Line had been designed to have standardized station layouts and a canopy that spanned much of the platform. Space for artwork was limited. Metro art program staff therefore developed a tailored approach to fit the specific needs of the project and identified eight to 24 locations for art panels at each station. Visible from the Expo Line platforms as well as sidewalks, streets and bike lanes, the art panels will add a continuous visual narrative describing the rail line as it moves through various neighborhoods. Durable materials ensure the artwork is resistant to graffiti and color fading. Metro art program staff worked with the Exposition Metro Line Construction Authority to design the art panel attachment details. Art program staff hoisted ladders at the station platforms to measure hundreds of brackets to ensure the framed artwork would fit perfectly into attachments at each location. The delivery truck is filled with art panels. Metro art program staff also spent several months overseeing the artwork fabrication, working with the artists to develop the finer details of the mosaic or tile. Finally, the artwork was crated and delivered to a frame fabrication firm that also assembled the artwork within the painted frames. Fabrication required over one ton of cement backer board. Piecing together mosaic often utilized more than eighty face-mounted segments for a single art panel. Last week’s delivery included all of the art panels for the Expo/Western, Expo/Vermont, Expo/La Brea and Expo Park/USC stations. Every element of the artwork – from the designs, to the physical tile, to the frames that house them – was crafted by hand. Ronald Llanos’ designs for Expo/Western Station depict illustrations of people engaged in city life translated into ceramic mosaic. Each tile was glazed by an artisan and cut into tiny pieces to create a rhythmic flow across the surface of the panel. Jessica McCoy’s watercolor paintings for Expo/Vermont Station, born from photographs of the local neighborhood, are also translated into ceramic mosaic. Highly specialized artisans mixed 1,500 custom colors to replicate the complex hues in the paintings. 5,650 hand-glazed tiles were snipped into tiny pieces to create the art panels. For Expo/La Brea Station, Jose Lozano collected images of Angelenos engaged in the act of riding public transportation. He then created a series of Spanglish Lotería cards, including drawings such as “El Luggage,” in which a smiling man is surrounded by overstuffed luggage. These panels were fabricated in porcelain tile through a process that requires each color to be laid down by hand then fired in kilns at temperatures that exceeded 1,200 degrees. Robbert Flick’s photographic images for Expo Park/USC Station are fabricated through a similar process. The images map the streets surrounding the Expo Park and USC neighborhood, creating a stream of images of the areas surrounding the station. When the truck arrived last week, the panels for all four stations were unloaded and placed in a secure location at the Expo Line construction yard. The art panels are expected to be installed at their respective stations over the next several weeks. More photos to follow as additional artwork arrives and installation begins. Art panels for Expo/Vermont Station are visible through the open crates. Crates with artwork for Expo/Western Station are moved to the storage location. Two forklifts lift the widest art panels from the truck and move them to the storage location. 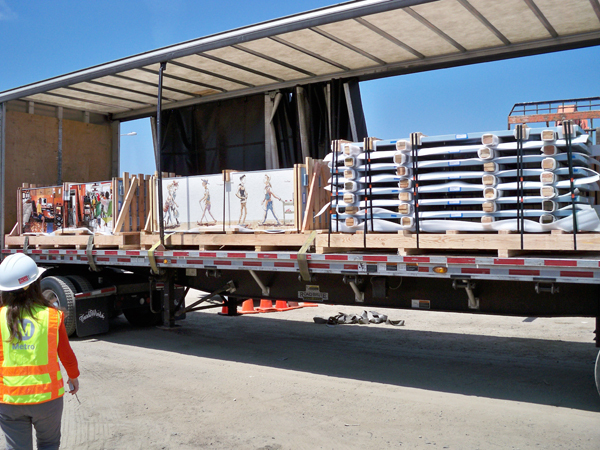 Art panels for Expo Park/USC Station reach their last stop before installation.